One of the points we have encountered in this survey of mezzo-sopranos is that, anxious as they are to find a place in the sun beside their "big sisters" the sopranos, mezzos are likely to be much more enterprising over repertoire. We have seen Magdalena Kozena couple Mozart and Gluck with Kozeluch. We have had Rebecca de Pont Davies singing mélodies by French women composers We have had cabaret songs from Malena Ernman and Chaminade from Anne Sophie von Otter. 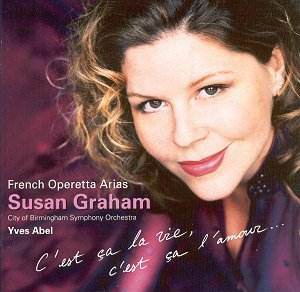 If Karnéus in Sibelius might seem a more "normal" choice from a Swedish singer (no complaints, it was a wonderful disc), here is Susan Graham exploring the later world of French operetta. For most people, French operetta means Offenbach. We know, perhaps only by hearsay, that Messager and Hahn wrote a good many, and yet, as Patrick O�Connor�s helpful notes point out, the genre survived longer in Paris than in any other city. The disc begins and ends (the running order is not as above) with extracts from the latest work here, Toi c�est moi (1934) by the Cuban-born Moïses Simons. This has a wonderful verve and also suggests that operetta had by this time reached the "crossover" stage where it was virtually identical with "light" music. These two pieces are very much in line with the sort of chansons that were to be immortalised by Edith Piaf, and might respond well to being sung that way. However, the rest of the disc does not really bear this out and those who love the peppery verve of Offenbach may be a little surprised (not, I hope, disappointed) to find that the predominant mood is romantic, post-Delibes rather than post-Offenbach. The Hahn works are from rather late in his career (his first operetta, Ciboulette, dates from 1923, considerably later than most of the songs he is best remembered by) while those of Messager stretch from 1897 (Les P�tites Michu) to 1928 (Coup de roulis), showing remarkable consistency over a 31-year stretch. One piece stands out from the rest: that from Honegger�s Les Aventures du roi Pausole (1930). Honegger, as we know, was a thoroughly serious composer and, more than actual operetta, this sounds like a serious composer�s rather acid stylisation of operetta, with a bit of cabaret thrown in. Operetta-lovers may not even like it, but I did, and also thought it one of the pieces which suits Graham best. For I now have to say that, though Susan Graham is unquestionably a fine singer, I feel she is perhaps not quite ideal for this music. She is a "high" mezzo, like von Otter, rather than a "low" one like Karnéus (her low Cs in Amour, amour are rather weak for a mezzo). In pianos, her voice has a creamier quality than von Otter�s, a quality which, as she rises to mezzo forte and beyond, becomes, not hard but a little "matronly". There is also a "beat" on the long medium-high notes which seems more suited to full-scale opera. Her final note in the Brummell piece has an almost tragic air that would be fine in Gluck. In other words, I find the actual timbre a little heavy for the music. In the Simons pieces I missed the devil-may-care verve of von Otter�s Chaminade and the Hahn lack something in evanescence. The more serious Messager � the most "operatic" pieces here � suit her best; Mon rêve, in particular, gets a most beautiful performance and so, as I said above, does the Honegger. But it�s all good singing, there�s no doubting that, and those interested in the repertoire should not be deterred by my slight doubts. She trios very effectively with herself in O mon bel inconnu. I praised highly Yves Abel�s conducting of Madam Butterfly in Chandos�s �Opera in English� series and the favourable impression is confirmed here. Hahn�s orchestra, incidentally, frequently has a prominent part for the piano, to rather fascinating effect. The recording is excellent, the notes, as I said above, are by a well-known expert in the field and we get original texts with an English translation. But � and I�ve niggled about this on other occasion � they are printed in white on a dark mauve background. Steer clear of artificial light and have a magnifying glass at the ready, and you should be all right.